A successful man is dynamic and not stagnant. Movement is the sign of life and inactivity means death. One has to always strive, struggle and move on to achieve success and stay on top. Inspiration and motivation is what gets one going. Different people get inspired by different ideas, some by awe inspiring personalities, some by thought provoking ideals, some by history while many by circumstances. Today I will show you how you can let nature be your inspiration. 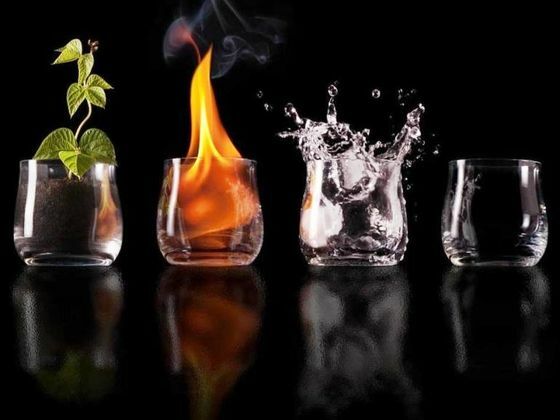 Nature has four elements, Earth, Water, Air and Fire. Here is how you can set these elements as your source of motivation to move up the success ladder. Earth: Try to hold your grounds when you have things going in your favor. Earth teaches you to stay firm, focused and productive. Earth teaches you stability, humility and modesty. People don’t say ‘down to earth’ for nothing. The deeper a seed goes to an earth, the stronger the tree becomes, make sure that your goals, aims and ideals are set to the very core of your personality, this is the only way you can realize your dreams. Sheer determination and rock solid dedication is the key to success. Water: Be flexible, adaptable and free flowing like water. An ocean is the perfect symbol of tranquility, peace and serenity. Look at water, it adjusts anywhere and everywhere, it is colorless so you need to direct your personality in the same manner, be flexible, easy going and without any tantrums. Water can adjust itself in any vessel, in the same manner, you try to adjust yourself in any circumstances and company. Don’t be rigid, be open to new challenges and always face the world with peaceful and calm mind. Air: Air symbolizes life, movement and dynamism. Keep moving, keep setting goals and always move ahead, there is just no looking back. Air enhances the power of the element it mixes with, in the same manner you be the strength of the people around you, keep motivating them, inspire them to do better and always be helpful. Air is the symbol of logic and intellect, a pen is mightier than a sword, hence make yourself heard by sheer logic and intelligence. Fire: Fire may look like a not so friendly element but it is the fire that should be the crux of your personality. You have to learn passion, aggression, fierceness and eccentricity from fire. Little bit of adversity is a must otherwise too much of leniency will make people take you for granted. You have to have that sort of driving force within you and this driving force needs to inspire others to emulate you, to follow you, to obey you, you be the leader, let your voice be heard and make sure that it is being heard far and wide. This is only possible if you have fiery passion burning inside you. You can take the world in your stride if you have that sort of aggression which can lure people to follow you.